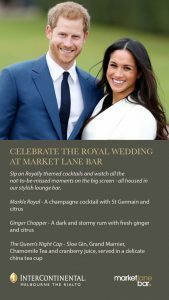 In celebration of the union between Prince Harry and Ms Meghan Markle on Saturday 19 May, Market Lane Bar, housed in the iconic InterContinental Melbourne The Rialto will be screening the special occasion and creating the perfect venue to view the most-watched international TV event of the year in style. You can watch all the intimate moments on the big screen whilst sipping Royally themed cocktails. With the official coverage starting from 7.00pm on Saturday, make sure you grab your friends, take a posy in one of our comfy lounge chairs and be ready to see ‘that’ dress and watch them say ‘I do’ in St George’s Chapel at Windsor Castle. 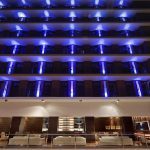 Perfect for all occasions Market Lane Bar was awarded the Best Hotel Bar in 2017.